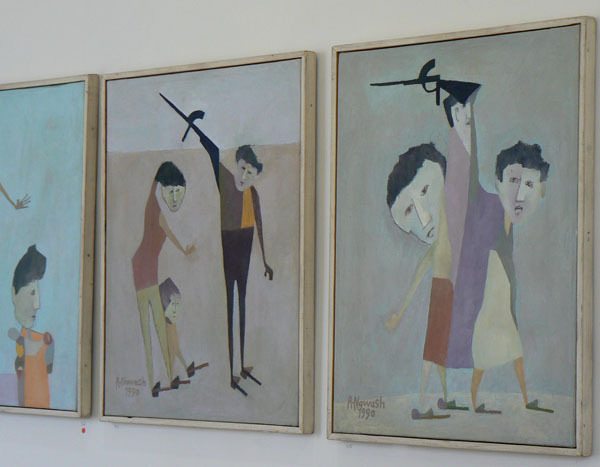 Paintings by Ahmad Nawash at Darat al Funin This and all photos are by the author. Many travellers visiting Middle Eastern countries such as Jordan will be in search of authentic cultural experiences. To most, that means Bedouin tents, crumbling Crusader castles or bustling souqs. The Jordanian capital, Amman, boasts ancient architecture such as a Roman amphitheatre and a museum with some of the earliest sculptures in the world. But it is also strikingly modern, with buildings that give an Arab twist to elegant modernist architecture, a series of galleries which provide the Western visitor with an introduction to the vibrant world of Arabic contemporary art, and cafes and bars in which to encounter the city’s bohemians. 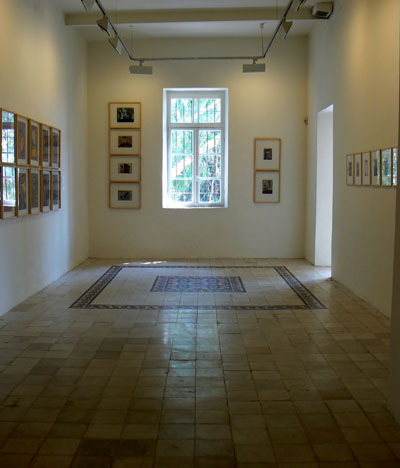 The most official of the art venues is the Jordan National Gallery of Fine Arts on Muntazah Circle, a half-hour walk through the leafy Luweibdeh neighbourhood from busy Downtown. In the scorching (45 degree-plus) heat of Amman in the summer, the National Gallery is, apart from anything else, a welcome cool, white space, but the exhibitions are also compelling. 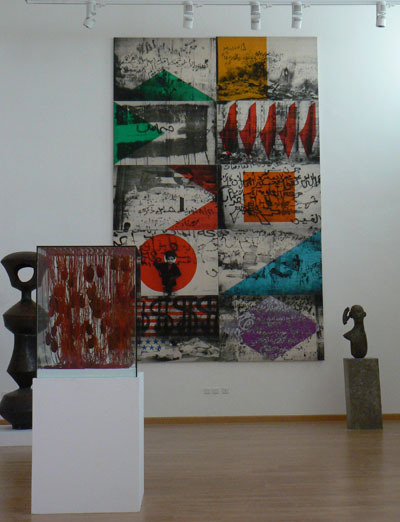 The downstairs galleries display a rotating selection from the permanent collection, which when I visited included a sinister textile piece resembling human hearts suspended in a glass case, and a vast printed work reflecting the bloody and conflictual politics of the region. Upstairs, temporary exhibits showcase modern artists from across the Arab world, working in a range of media and dispelling the notion that Islamic material culture stops with classical patterned tiles or Ottoman miniatures. The garden in the large square outside, planted with scented shrubs and shady trees, is also home to several large modern sculptures. Heading back towards the city centre, Darat al-Funun stands on the steep slope overlooking the honking mayhem of the Downtown area. Despite this, it’s another haven of cool and calm in Amman. This ‘Little House of the Arts’ is formed of three 1920s villas, one of them with the blue-roofed veranda typical of the city’s Circassian population – the first main community to re-establish themselves in the nineteenth century after the city had been reduced to a village for hundreds of years. As well as a paved, shady courtyard which serves as a cafe and the remains of an early medieval church, Darat al-Funun is home to some of the edgier contemporary art to be seen in Amman’s galleries. The sometimes bitter and violent paintings, stark photography or politicised video installations contrast with the calm white walls and elegantly patterned floor tiles, while outside modern sculptures set on the outer walls or amongst the mimosa trees have views of the city as their backdrop. The gallery also hosts artists’ workshops and a regular series of talks and films (many of them in foreign languages), details of which are listed on its website. After all that art viewing, even the most dedicated buff will be in need of a long, cool drink. 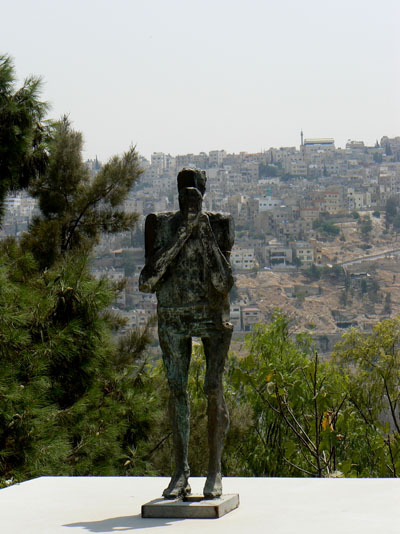 You might just be in the mood to head across Downtown to Jebel Amman and the Rainbow Street area, which has been restored to include street murals and small squares and open spaces amongst the quiet cream stone houses. This newly-upscale area has attracted a range of trendy international restaurants, shi-shi art galleries and institutions like the Wild Jordan Cafe, an NGO-linked centre which hosts gigs and readings, as well as promoting fairly traded traditional local crafts brought up-to-date for contemporary buyers. The thirsty gallery-goer in the Rainbow neighbourhood might first head for the lusciously-named Mango Street (unfortunately named after a prominent business dynasty, not the fruit). Here, Books@Cafe is still the place for visitors to track down a bohemian, literary crowd, a wide range of books and periodicals in English or Arabic, free wifi, and cosmopolitan cuisine. 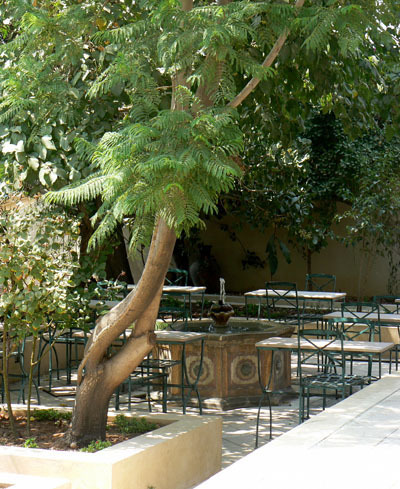 Its 70s-loud decor has sprawled out from the original space to a series of rooms and terraces, offering (depending on the time of day) lush breakfasts, good pasta, pizza or contemporary Arabic food, nargilah, and a well-stocked alcoholic and non-alcoholic bar. It’s also a great place to watch Amman’s affluent, arty young professionals, and to realise how deeply uncool your own sweaty traveller’s garb really is. If you’re thinking of a trip to the Middle East, MatadorNetwork’s Middle East Focus Page is a great place to start getting ideas of where and how to go. Number Six on BNT’s Photo Essay: 10 Sacred Mountains Around The World is Mount Nebo in Jordan, so preview the highest point of the city there. MatadorTrips features In Jordan, Forget Lonely Planet. Bring a Bible for a less contemporary take on the ancient city.